World War II Legacies: Stories of Northeast Indiana Veterans is available! 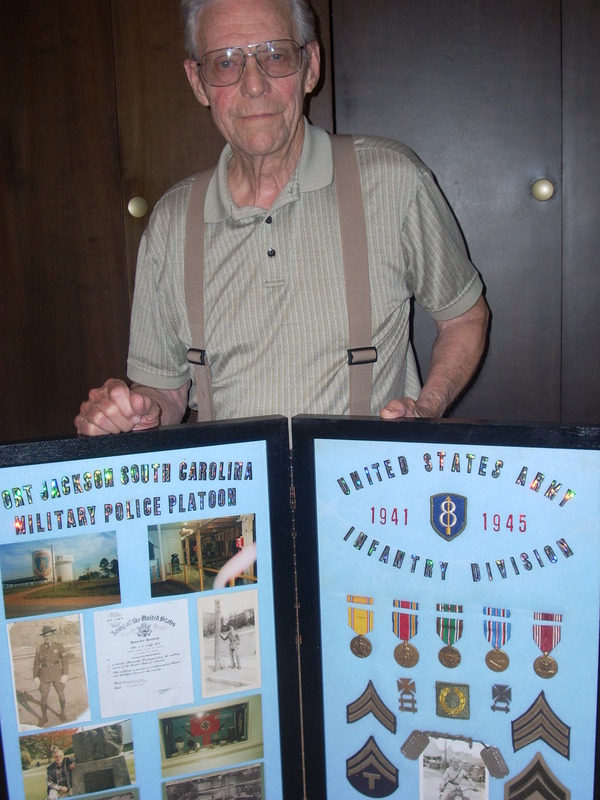 WWII vet George Buhler displays his medals earned during military service in Europe. It’s the start of a new year and I’m excited about the possibilities! 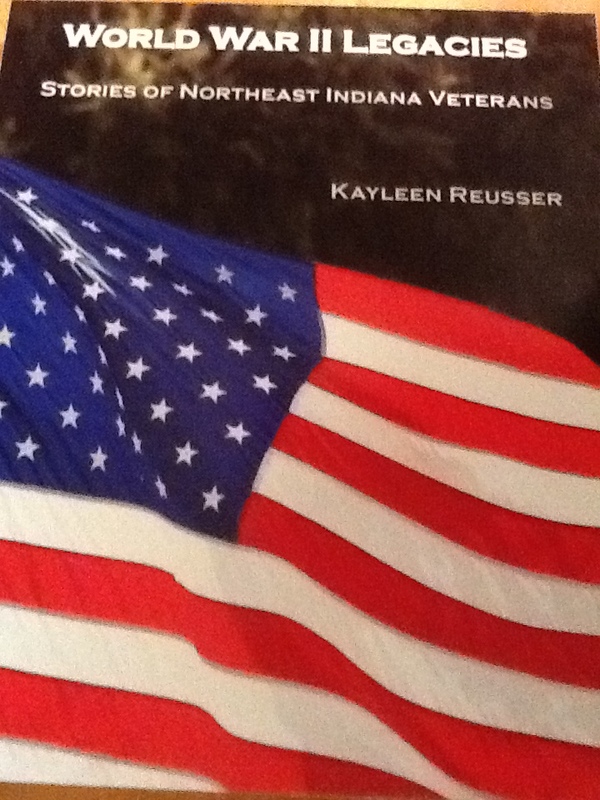 In 2014 I published my first book— World War II Legacies: Stories of Northeast Indiana Veterans. My publisher was Oak Creek Publishing. The man in charge, Ed Schwartz, has now changed it to Oak Creek Media. I highly recommend Ed and his crew, including his son Rick Schwartz who shot my cover photo, for anyone wanting to self-publish. My book, World War II Legacies: Stories of Northeast Indiana Veterans, is available from me for $20+$4.95 P/H=$24.95. Please send a check to Kayleen Reusser, 1524 N Sutton Cir Bluffton IN 46714. We’ll mail it the day after the check is received. Christmas might be over but you have friends and relatives who would love to read about 28 World War II vets who risked their lives for our country’s freedoms! In summer 1945 Buhler’s division moved to Brest, Germany. Brest was a major German submarine port in northwestern France that Allied forces hoped to seize. Securing it from the highly trained Germans had proved extremely difficult in the past. Now British troops dropped 2,000-pound bombs on them. “We stayed in fox holes much of the time to avoid concussion from the explosions,” said Buhler. By September 1944 the Allies had recaptured the town. 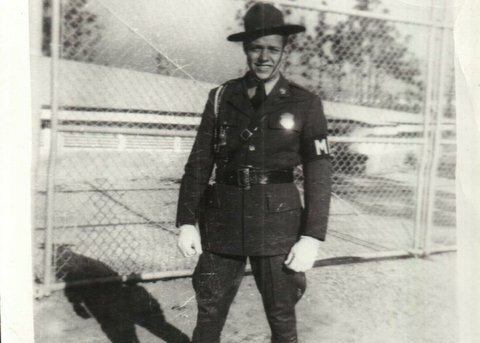 George Buhler from New Jersey served as Army military police during WWII. In September Buhler was part of the Allied liberation of Paris. He performed traffic duty at the Champs Élysées. That fall Buhler’s division encountered further ferocious combat in Germany’s Hertgen Forest, east of the Belgian–German border. “It was cold and brutal,” said Buhler. “Mud came up to our knees.” Casualties in Hertgen Forest were said to number in the tens of thousands. 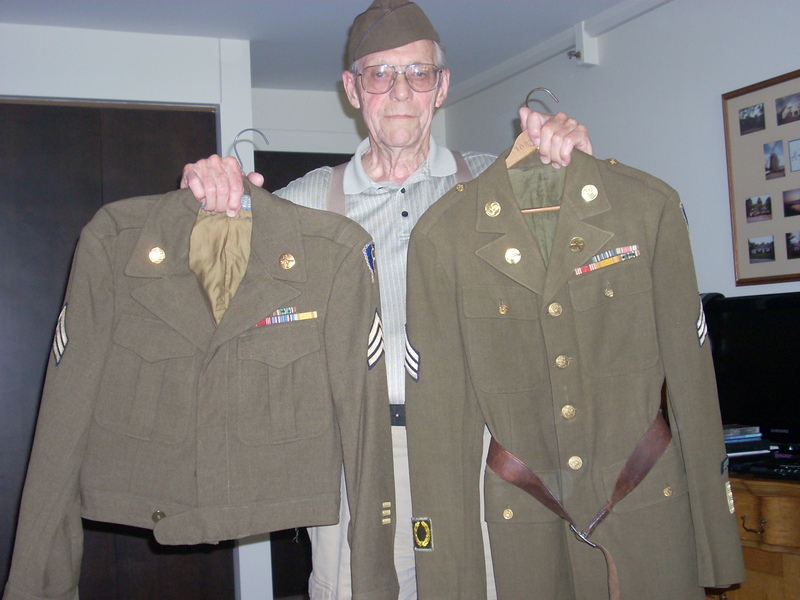 Buhler was 1 of 4 brothers who served in WWII. One brother survived a German POW camp after his B17 was shot down. Buhler went next to the Battle of the Bulge, another violent melee in Belgium’s Ardennes Forest. “We lost a lot of people,” said Buhler. “There was a lot of misery.” Sleeping outside for weeks in fox holes in record-low temperatures caused frostbite for many GI’s. In March 1945 Buhler was involved with the taking of the railroad bridge at Remagen, Germany. Aware that the Rhine River posed the last major geographic obstacle to Allied troops, Hitler had ordered the bridge over the river destroyed. “The Germans shot 18-inch shells from railroad cars at us,” said Buhler. Allied troops saved the bridge, enabling 8,000 Allied troops to cross it. I am part of a US military family—my husband is retired from the Air Force and our son is a pilot in the Air Force. My goal with this book is to promote patriotism and appreciation for our soldiers, young and old. My other goal is to try to interview as many World War II vets as possible while they’re still available. The book also lists the World War II vets who have participated in the Honor Flight of Northeast Indiana. This is a terrific organization that helps send World War II and Korean and Vietnam vets to Washington DC to see our country’s military memorials. I hope to accompany a flight in 2015 as a companion to a veteran. Please support our military with financial and emotional encouragement to organizations like the Honor Flights in your area and other military organizations. Thanks for your kind words. I appreciate your interest in WWII. Together we can help people appreciate more about what our oldest veterans have done for us. I am so glad you wrote this book, and I plan on buying it. I wanted to inform you that my husband’s great uncle Red Batchelder passed away as you may or may not know, and the his story, like all of these great individuals lives on because of your book. Thank you for taking the time to write these down so that future generations may benefit from it!